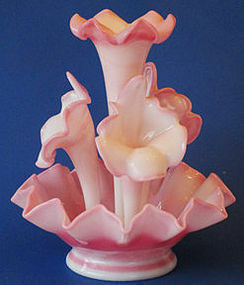 This Fenton Rosalene 5-pc. Epergne is highly sought after. Made as part of the 1990 Connoisseur Collection, it is in mint condition. Stands 13" tall and is 11" at its widest. Numbered: 487/2000. (For collectors info, Fenton probably did not made all 2000. The problem was that Rosalene is very acidic in the molten state causing the glass to eat through the copper pots.) The bowl is the largest/heaviest size made. 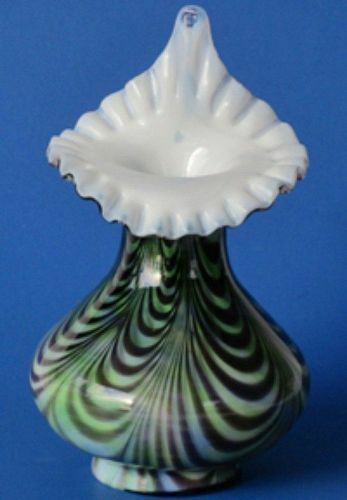 Fenton later only made smaller items when using Rosalene. 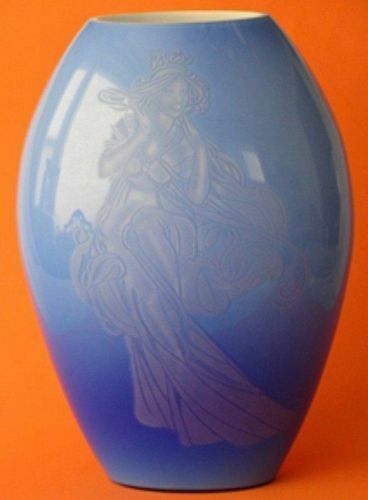 Fenton made this Royal Blue (cobalt) vase for its Connoisseur Collection of 1998. Most people do not know that the two vases present images of Summer and Winter on one vase, and Spring and Fall on the other. Rarely seen as a pair! Both in mint condition with papers. Other information: Original was designed by Martha Reynolds and Carl Schmirz. The spring/Fall Vase, 1998 is #397/1350. The Winter/ Summer vase is #623/1000. Both have an embossed Fenton logo on the bottom. The mold was originally made by Verylls. If you have any questions, please feel free to ask. 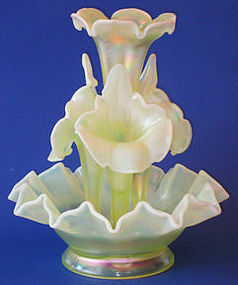 Fenton made this Topaz (vaseline opalescent) 4-horn Epergne in 1997 as part of their Historic Collection. 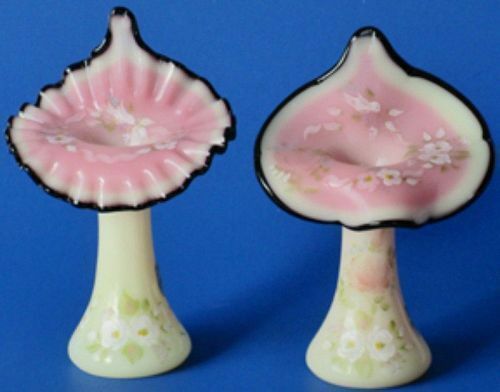 This 5-part epergne is 13" tall and 11" at its widest. In mint condition. 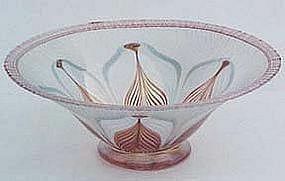 Dave Fetty, a premier glassmaster for Fenton used the feathering feature often associated with Art Nouveau. 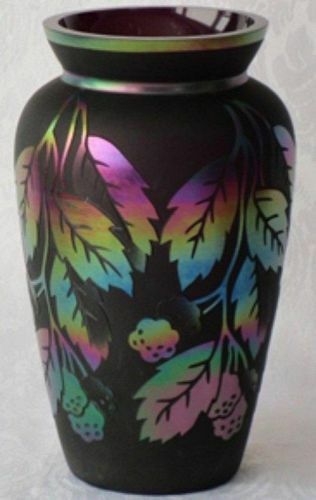 This 7" jack vase, cased in milkglass with pulled black feathering has a rainbow of subtle tones embedded in the piece. Look closely -- it's there along with the green. In mint condition and originally purchased in "The Upper Room" at the Fenton factory during convention time (for those who know about the room -- Items could only be purchased by convention-goers). Only a few of these were made in this color combination. 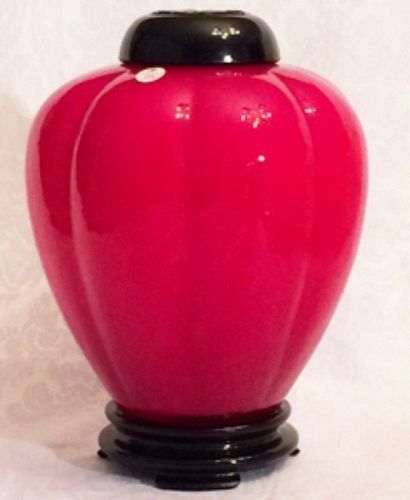 Fenton made this Red Ginger Jar in 2005 as part of its Platinum Collection. It is 3 pieces: red jar, black lid and base. Altogether, it stands 8.5" tall (with base and lid). It is in mint condition, limited number: #908/2500. 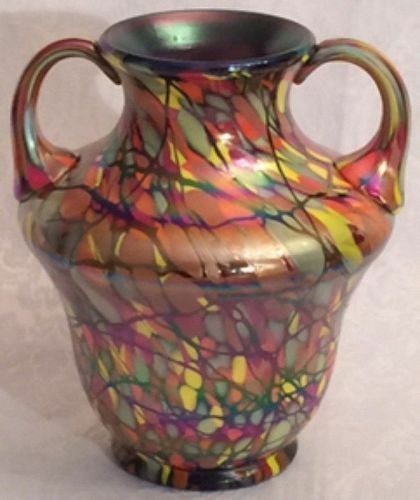 Fenton New Mosaic Squat Vase, 6"
This Fenton New Mosaic Vase is 6.5" tall. It is numbered #901 (no mention of how many were made -- unusual. 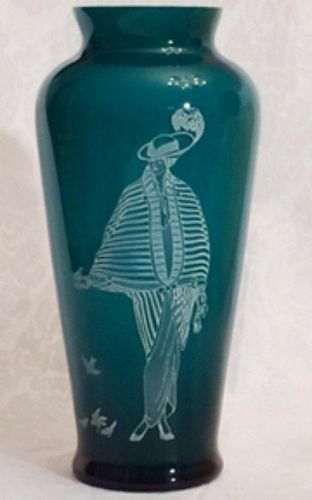 Made as part of Fenton's Centennial Collection of 2005 honoring their past and celebrating the future with this unique art glass creation in Mosaic glass, signed by George W. Fenton. It is in mint condition. 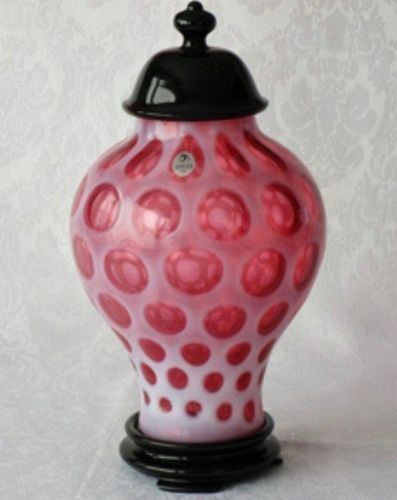 Fenton made this New Mosaic vase as part of the 2006 Connoisseur Collection. It is in mint condition, stands 8.5" tall, and is #389/1250. 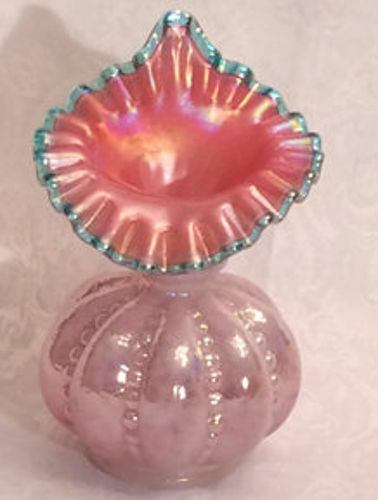 This 8.5" Hanging Heart Vase was made by Fenton for the Fenton Art Glass Collectors Association in the 1980's. A definite rarity where black (black amethyst) and white were combined. In mint condition. 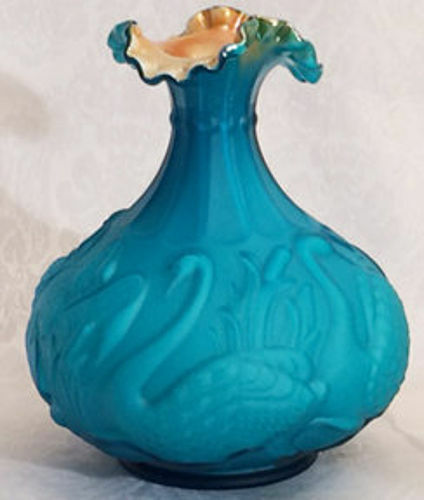 This 10.5" vase was made as part of Fenton's Connoisseur Collection in 1986. It is teal cased milkglass. It is sand-carved in an outline mode to make the image of "Danielle" -- an elegant lady of the 1920's feeding birds. It is in mint condition, it is number 440/1000. 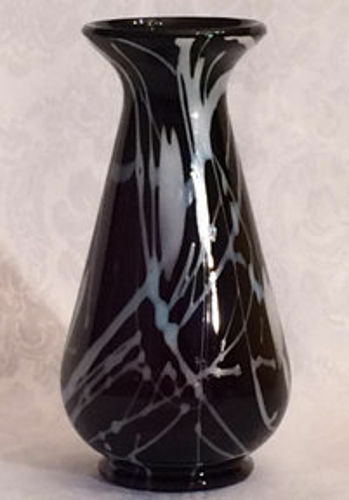 Vandermark Fan Vase made in 1984, series #1503, and in mint condition. Signed by the artist. 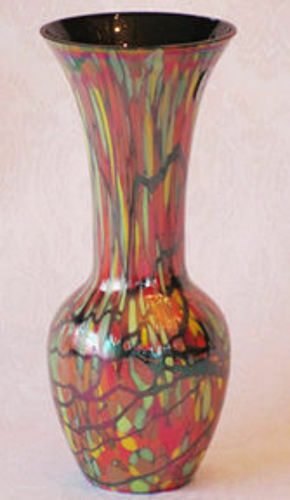 Vase stands 13" tall and at the widest is 8.5". 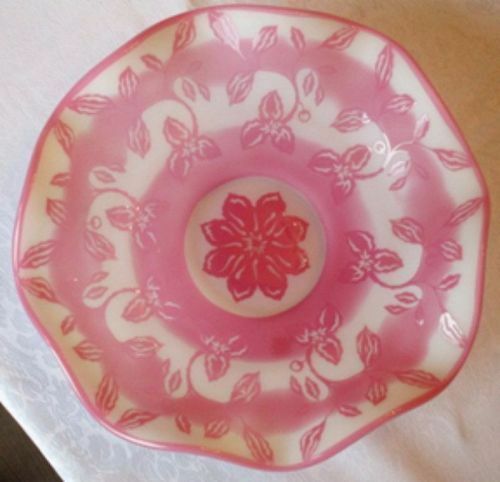 Vandermark's philosophy was to compete with the old Tiffany art nouveau line. He was very successful! 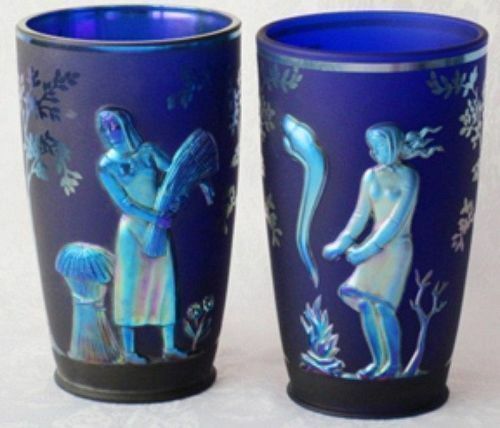 Vandermark artglass is contemporary glass made in the style of art nouveau. This piece was made in 1981 in June. It is marked "1981-6", signed by the artist and numbered 0455. It measures 9.75" across the top and is 3.5" deep. This piece of stretchglass is in excellent condition. There is a pontil mark on the center of the base (normal).